How many cool cars have your heard of overseas that never seem to make it to North America? There are tons, actually—too many to go through. Those darn Europeans and Japanese often keep the best ones for themselves, but occasionally, one makes it across the pond to our shores much to the delight of enthusiasts. The Hyundai Elantra GT is one of those cars. Essentially a rebadged European Hyundai i30, the Elantra GT is far different from its sedan sibling. It gets its own wheelbase, a unique engine option, a spicier interior and a standard eight-inch touchscreen to control the infotainment system. It also just looks sportier than the sedan and can match wits with any of its competitors such as the Ford Focus, Mazda3, Volkswagen Golf or Honda Civic hatchbacks. From the minute I got into the vehicle I was impressed with it. Our tester was the top-of-the-line GT Sport Ultimate with the 1.6-litre turbo engine and dual-clutch automatic transmission, so having all the bells and whistles does help with the “wow” factor. 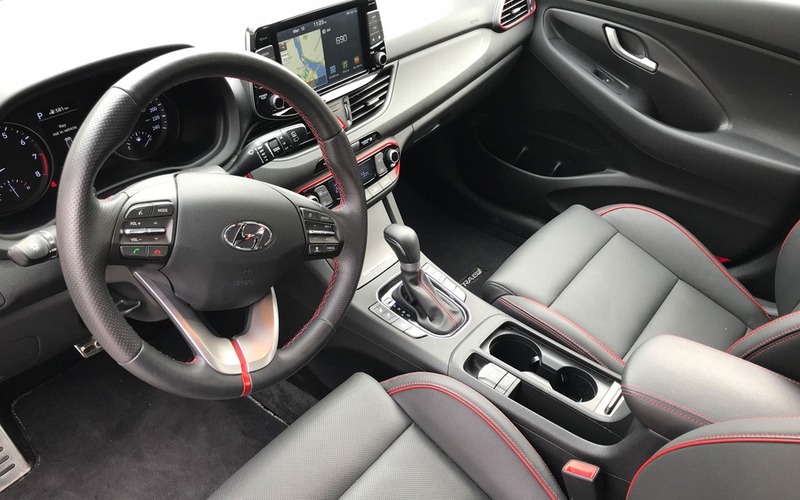 Things like LED headlights, an eight-way power-adjustable driver’s seat, heated and cooled premium leather seat surfaces with red stitching, flashy red dash trim, red seatbelts and all the safety features you could imagine make for an enticing package. The interior quality of the Hyundai is good and the seating position is both natural and very comfortable. There are a few things which didn’t quite meet the level of expectation that they should have. For instance, the volume control dial is too high up and out of reach. I realize many people would respond with “just use the steering wheel mounted controls,” but I reject that. The volume knob should be well within reach no matter what. Another aspect that needs changing is the door lock/unlock button location. Seemingly impressed by BMW’s asinine habit of placing this button in the centre of the dash (rather than say, on the door where is should be) the Elantra GT will most definitely cause you headaches when entering or exiting the vehicle with your family. Enough nitpicking now, let’s get to the good stuff because there is plenty. I mentioned I was impressed with the Elantra GT from the minute I sat in it and I wasn’t lying. The infotainment system was a breeze to operate and I was able to pair my phone, set the satellite radio stations and off I went. The 201-horsepower, turbo 1.6-litre inline four-cylinder engine hauls the compact hatch like a pro. In addition to being fast, the GT sticks to the road like glue. I don’t know whether it was because my expectations were a bit off coming into this road test, but the entire seven days I had the Elantra, I just kept thinking how amazing it felt to drive. It was effortless, precise, solid and thorough in its operation in every aspect except for the transmission. While I liked the DCT unit, it hesitated a little too often when asked to accelerate more forcefully from a stop. One other thing to note is that the multilink independent suspension is found on the Sport trims only, so if you opt for the base model, the ride may not be as exciting. If you’re on the fence between this and the Elantra sedan I think the choice is clear. The hatchback offers a better ride, a jazzier interior and more cargo space. It is a bit more expensive, so obviously this has to be factored into the decision. The least expensive GL trim level with a manual transmission and a 162-horsepower, 2.0-litre four-cylinder engine will run you $20,449 before freight and delivery charges. You can move up the ladder with the GLS ($24,099) or Sport manual ($26,999) to take advantage of some of its great features. To get all the safety gadgets including autonomous emergency braking with pedestrian detection, lane keep assist and lane departure warning, you need to shell out $30,499 for the Sport Ultimate with the DCT. 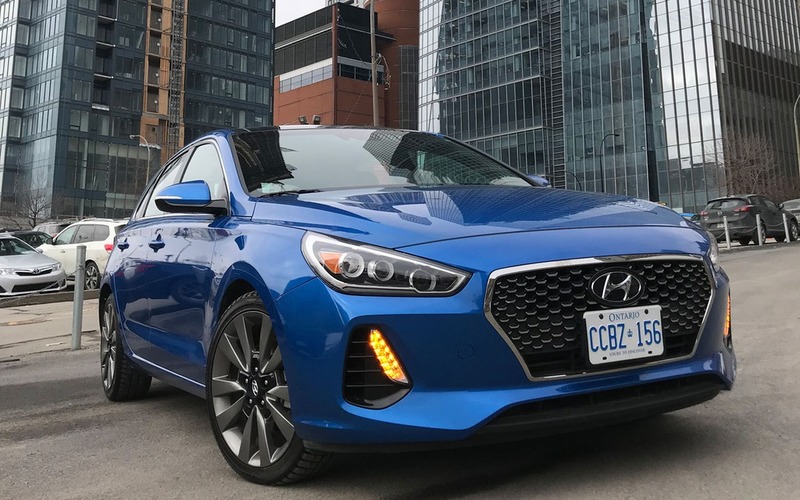 The 2018 Hyundai Elantra GT represents excellent value in a sporty hatch and can compare with the likes of the Golf GTI and Honda Civic just fine. It will also do it a lower price point, which makes it a force to be reckoned with. 6/10	I did only city driving, so it's expected to be higher than normal. 8/10	Very comfortable all around. 8/10	Strong performing engine and suspension. 8/10	Good all-around system that is easy to use. 9/10	Very satisfying to drive and handles the road with ease. 8/10	A fine package that will do well in this segment. This year, Hyundai is introducing the 2018 Kona, a vehicle that will become the smallest—and most affordable—SUV in Hyundai’s Canadian lineup. Positioned under the Tucson, the Hyundai subcompact SUV has one mission: to go after the category’s top models, like the Mazda CX-3, Honda HR-V, Nissan Qashqai and Subaru Crosstrek.